Note: only users with access to the System settings can create new user accounts. Unlimited external user accounts for artists, tour managers and external booking agents are free of costs. Go to System settings > External users. 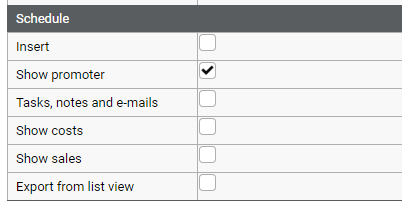 Enter all the details for the new user such as their first name, last name, position, username and email. After saving, the user will automatically receive an email with their login credentials. Set the permission rights of the user. 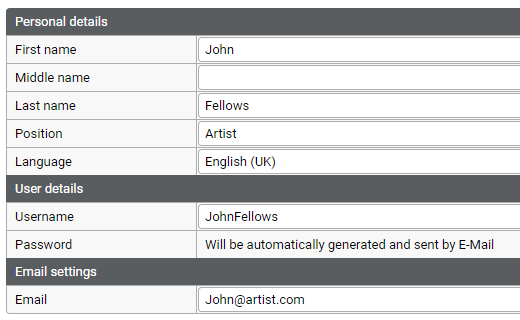 The artist(s) to which the external user has access to are listed once selected. 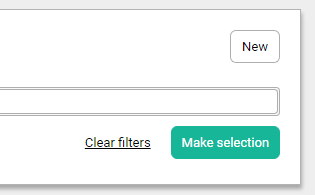 In the Free fields section you can decide which free fields are visible to the user. Don't share accounts between people. Make an account for each individual. This makes it a easier to revoke someone's access in the future.